Heat oven to 350°F. Spray 48 mini muffin cups with cooking spray. On lightly floured surface, roll each crust into 12-inch square; cut each square into 24 pieces. Shape into balls; press in muffin cups. In 12-inch skillet, melt butter over medium heat. Cook onion, green onions and parsley in butter, stirring occasionally, until tender. Add spinach; cook 2 minutes. Stir in Worcestershire sauce, salt and pepper. Remove from heat. In medium bowl, beat eggs and milk with whisk; stir in cheese. Add egg mixture to spinach mixture; stir to combine. Spoon into dough-lined cups. Bake 30 to 35 minutes or until set. Remove immediately from pans to cooling racks. 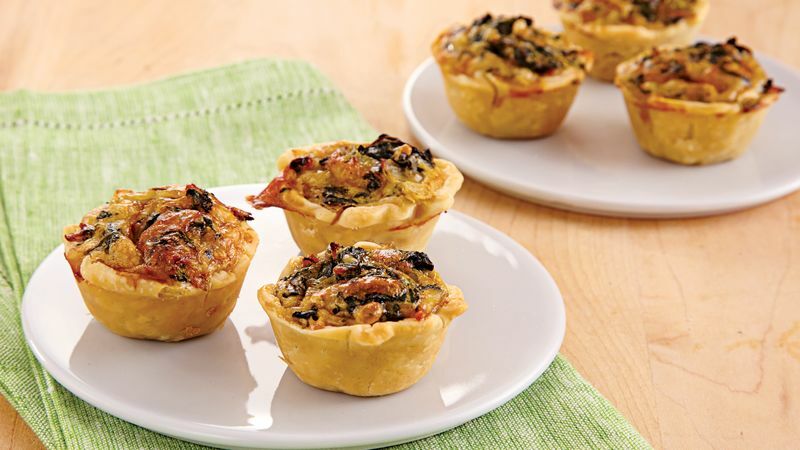 To Freeze: Place cooled baked quiches in freezer containers; freeze up to 2 months. Thaw in refrigerator overnight. Place on cookie sheet. Bake at 300°F for 10 minutes or until hot.